Are you ready for a sightly eerie story? You may remember that several BABMers went to Camp Magruder in Oregon last October to participate in the Columbia Basin Basketry Guild retreat. Nancy B, Jutta, and I took a class from Judy K. Wilson. 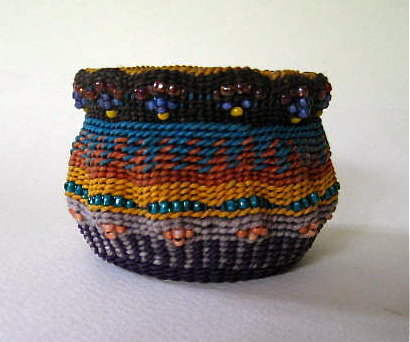 I finished my colorful, twined and beaded basket at home and brought it to a meeting. I took it home and carried it around for a while in order to show it off to my local basketmaker friends, and then promptly forgot where I put it. I occasionally looked for it but wasn’t alarmed. One day recently, I pulled up in front of my friend Virginia’s house and a splash of color caught my eye on the curbside mailbox of her neighbor. I looked more closely and got a creepy feeling on the back of my neck. There, hanging on a nail below the mailbox was my little Judy K. Wilson basket. I couldn’t believe my eyes. It was none the worse for wear but had an abandoned spider nest tucked inside. I grabbed it and ran. Virginia called her neighbor and found out that it had been in her garden. She didn’t know what it was or where it had come from so she hung it on her mailbox. It still amazes me when I think of it. Now, just a glimpse of my precious basket makes me believe a little bit in garden trolls.